AES+F Group, Allegoria sacra (sacred allegory), 2010-11, 39:39 minutes, 3 channel moving image with sound. Ambrosius Benson, Man praying, Late 1520s, Oil on wood panel. Jake & Dinos Chapman, Das Swings unt Roundabouts fur der kinder? Ja? Nein! Schweinhund! (Swings and Roundabouts for the children? Yes? No! Pigface! ), 2011, glass-fibre, plastic, mixed media. Jake & Dinos Chapman , No Woman, no cry, 2009, glass-fibre, plastic, mixed media. Francisco Giralte the Elder,The Meeting at the Golden Gate, c. 1550s, pine. George Elgar Hicks, The Dead Goldfinch (‘All that was left to love’), 1878, oil on canvas. Henri Fantin-Latour, Zinnias, c.1897-99, oil on canvas. HJ Johnstone, Evening Shadows, backwater of the Murray, South Australia, 1880, oil on canvas. Johann Victor Kramer, The Descent from the Cross, 1886-87, oil on canvas. Yayoi Kusuma, Infinity Dots, 2001, synthetic polymer paint on canvas. Frederic Leighton, The Feigned Death of Juliet, 1856-58, Rome, Paris and London, oil on canvas. 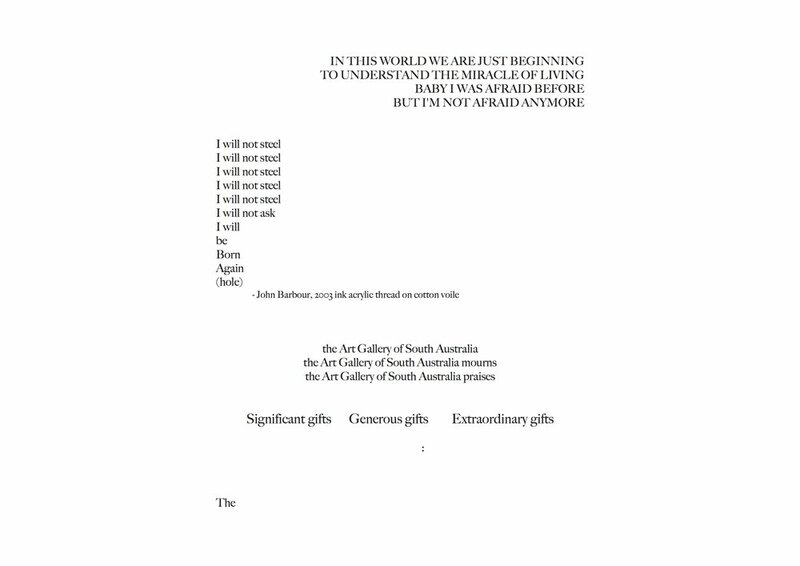 Colin McCahon, The Five Wounds of Christ no. 2, 1977-78, Synthetic polymer paint on canvas. Albert Moore, A workbasket, 1879, oil on canvas. Unknown (Germany 18th Century), Our Lady of Sorrows, Limewood. George Frederick Watts, Love and Death, 1901, oil on canvas. Chiusi, Cinerary urn lid, Etruscan 2nd Century BC, Terracotta. Chelsea Porcelain Works, Vase (three friends pattern), 1745 – 49, porcelain, enamel. Thomas Tompion, Bracket Clock, c. 1678, oak, walnut veneer brass, gilded brass, iron, glass. Balthasar van der Ast, Still Life, 1622-23, oil on copper. Jacob van Ruisdael, Landscape with a Mill-Run and Ruins, c. 1653, oil on canvas. Rene Lalique, Dragonflies Brooch,1903-05, Gold, Australian opal, Plique-à-jour enamel. Giorgio Lucchesi, Still Life, 1901, oil on canvas. Unknown, Coffer with drawers, oak, inlaid wood (unidentified), iron key, plates. Haniwa Dog, c. 6th Century, Japan, earthenware. Funerary mosaic fragment (Parthian), 2nd-3rd Century AD, Edessa, northern Syria, stone, mortar. Matthew Monahan, 5² Mask (Scarab), 2016, aluminium. Male Funerary head (Sabaean), 3rd – 1st Century BC, Saba, South Yemen, alabaster. Horseman (Boeotian), 6th Century BC central Greece, terracotta, painted decoration. possibly the workshop of Gudio da Merlino, View of the Underworld Tazza. 1540-1550, earthenware, majolica. Auguste Rodin, The Three Shades, 1881-83 (G. Rudier Foundry, cast 1973), bronze. Alex Seton, My Concerns Will Outlive Yours, 2011, Wombeyan marble, stainless steel eyelets, halyard. Walter Sickert, The Pheasant, c. 1919, oil on canvas. Bernardo Strozzi, St Francis of Assisi adoring the Crucifixc. 1615, oil on canvas. Ricky Swallow, The Exact Dimensions of Staying Behind, 2004-05, laminated lime wood. Monte Masi is an artist and writer in Adelaide, South Australia.